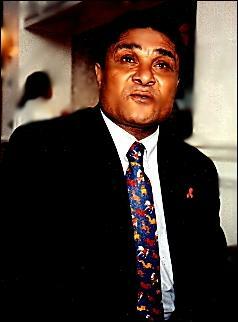 His name is Eusebio Da Silva Ferreira , but the world knows him simply as EUSEBIO. 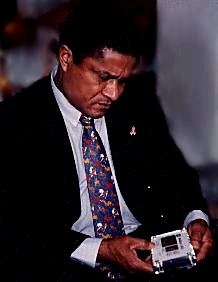 Eusebio's trademark was a spectacular shot which, allied to powerful running and fine dribbling skills, made him one of the most dangerous strikers of his era. 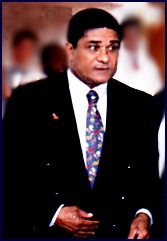 Capped 74 times for his adopted Portugal, and scorer of 46 goals in European club competitions, Eusebio was widely popular not only for his footballing ability but also his exemplary sportsmanship and commitment. He was not born in Europe but born and raised in Mozambique which was then one of Portugal's African colonies. 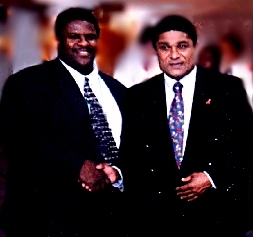 In 1986 at Wembley Eusebio nearly won the European Cup Final for Benfica against Manchester United. 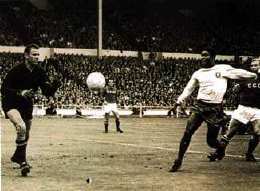 It was at Wembley that Eusebio began his international career when Portugal lost 2-0 to England in an exciting World Cup qualifier. One of his finest moments was when he led Portugal to a third place finish at World Cup 1966. There is a statue of Eusebio; one of the great footballers in history at the entrance to Portugal's Estadio da Luz. We recently met this living legend while in Europe, and are very proud to have conducted the following interview which appears in this, our first feature of "Legends of La Cancha." Q: What was one of your greatest moments as a footballer? A: There were many great experiences that I had playing football. It is very difficult to choose one at this time, however playing in the 1966 World Cup was a wonderful moment. Q: Who would you consider to be the best player of all time. A: There were many great players during my time, before, and after me. Today many people believe Ronaldo is the best player. This is a difficult question because there are different positions as well as rules. The rules can also determine the type of play you will see. But in my opinion, I would have to say Pele was the best player of all. Q: How would Ronaldo compare to Pele? A: You cannot compare the two persons. Pele played in an era which had so many great players and in that atmosphere he stood out above the others. He was the complete player in every aspect as well as being a kind human being. Ronaldo is young yet, and has many years ahead of himself. 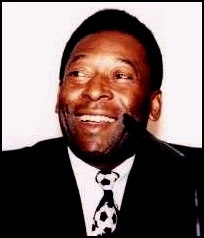 But as of now, I do not see anyone who can compare with Pele. Q: Many people consider you to be the greatest player that Africa has every produced. What is your opinion? A: I am honored to be considered in that way however, I loved the sport of football and played only to win. If others want to say such things I am very honored. Q: What do you consider should be the goal or purpose of the sport of football? A: Although football is a sport, it represents more. It is a way for youth to develope themselves and a vehicle of communication for all people. The World Cup for example is a way that people from many different backrounds can come together not only for the purpose of winning a cup, but more importantly to learn about each other through communication on and off the playing field. Q: Speaking of fields, which playing surface would you consider to be the best you have ever played on? A: Again,. this is a very difficult question. I love the fields of the country where I was born as well as those fields in Portugal. If I had to choose one I would have to say that Wembley was my favorite playing surface. Wenmbley has such an historic and prestigious backround. The grass surface is very well kept. It was like playing on carpet. Q: Do you, as other believe that the quality of the playing surface such as grass height can affect the level of play? And what type of surface did you prefer as a player? A: Yes, the length of the grass is important. For instance a short cut dry surface is good because the ball will travel faster. I believe that most players prefer that type of surface. If you are a good player however, you can adjust to any circumstance many times we have played during rain on a wet surface. A good player can make the adjustment necessary to play under less than good circumstances. Q: What will be the future of football? A: Football as you know is the most popular sport in the world and it is still growing. The World Cup for instance has many more countries involved now than when I was playing and I expect that the number of countries will grow over the years. 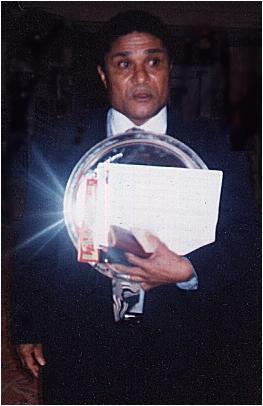 It is such a popular sport because anyone can play whether you are poor or rich. All you need is space and a ball. One's physical build is not that important that is why so many children play the sport. You don't have to be big and strong. You must only have a desire to play.